Awadh and Allahabad were preponderately Hindu provinces in the eighteenth century with only a sprinkling of Muhammadan population in them. Even after well-nigh two hundred years that have elapsed since the death of Safdar Jang Musalmans in these provinces are still in a small minority. The most notable element of population then were Rajputs, spread over the whole territory and divided into numerous clans and septs and branches of these septs. Prominent among them were the Baisas and Kanhpurias in the modern district of Unao and Rae Bareli, the Bisens and the Janwars in Gonda, the Raikwars in Bara-Banki, the Sombansis in Pratabgarh, the Khichers in Kora Jahanabad and the Bundelas in Bundelkhand. Each of the big or small Rajput chief possessed a strongly built brick or mud fort (Garbi) in an almost inaccessible village, surrounded by a belt of thick forest, and exercised de facto sovereignty within his estate. He granted jagirs to the younger branches of his family and to pious Brahmins and village artisans, levied tribute from petty zamindars under him and summoned the levies of his clansmen to service in times of war. So closely was he connected with his land and people that practically he could not be deprived of his estate by the provincial authorities. 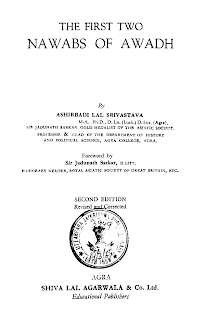 The next important class was that of Brahmins, chiefly of Kanya-Kubja sub-division, some of whom were priests, astronomers, astrologers and teachers, while others chose the career of a soldier. They formed the best fighting element in Awadh, next only to the Rajputs. The Pasis were soldiers as well as watchmen, while the Ahirs and Kurmis were the principal agriculturists. The Musalmans were then an essentially urban people and had not taken to any other profession except that of a soldier or of a civil officer. The most numerous among them were two classes ― Afghans and Shaikhs. The Afghan families had their colonies at Jaunpur, Allahabad and Malihabad, while the Shaikhs had settled in large numbers in Lucknow, Kakori, Khairabad, Gopamau, Pihani and Bilgram. A large number of Saadat Khan and Safdar Jang’s friends, officers and troops, several thousands of whom were Iranian Turks, settled at Lucknow and Faizabad. In the former city some of the muhallas (quarters) like Katra Abu Turab Khan, Katra Khudayar Khan, Katra Bizan Beg Khan, Katra Muhammad Ali Khan, Katra Husein Khan, Sarai Maali Khan and Ismail Ganj (all of them still in existence except the last) were named after some of the Nawab’s officers and commanders. At a distance of four or five miles west of the ancient town of Ayodhya, Saadat Khan founded, on the bank of the Ghagra (also called Sarju), a new town and named it Faizabad, adorning it with stately buildings and pleasant gardens, and asking his troops and officers to build houses for themselves and settle there. Safdar Jang added to its edifices and increased its population. Faizabad thus became a Muslim colony of first importance in Awadh in the first half of the 18th century.